Let just start by saying, I love teriyaki sauce. When I went gluten free, and started having issues with it because of the wheat in soy sauce, I was heartbroken. My favorite go-to meal at restaurants was gone! And then I found this recipe. It is fantastic! I love the ease of the slow cooker, the flavor of the sauce, and the versatility of the recipe. Great way to make take-out without paying the price of take-out! Cook your rice ahead of time. It’s a lot easier to reheat the rice than try to cook it while making the sauce for this as well. See my baked rice recipe in the Refrigerator Door section of the newsletter! Mix up your vegetables for variety- I love carrots, but sometimes I like doing broccoli and cauliflower with this. A mix of steamed veggies, sautéed zucchini, or any other vegetables would be great for this too. 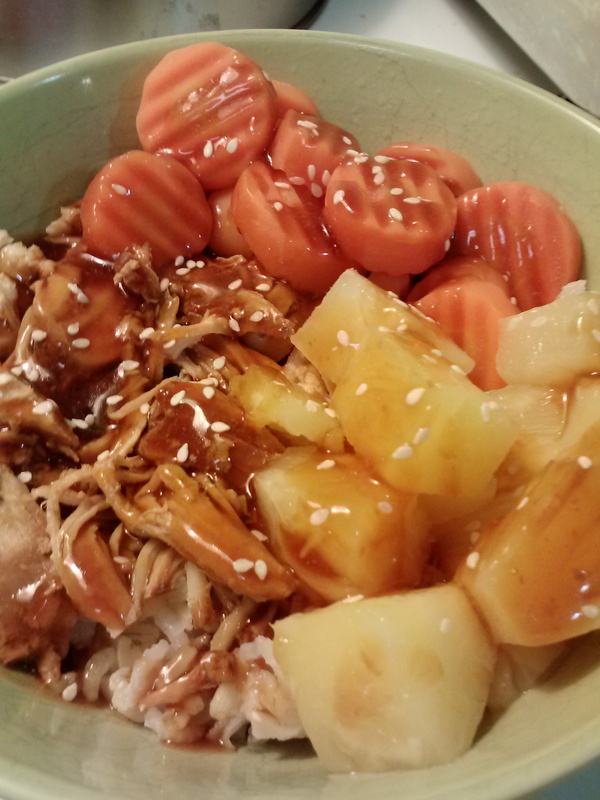 Try different types of toppings as well- I used sesame seeds, but you could use sliced green onions, red pepper flakes for spice, or whatever you want. You could try different types of meat as well. While I used chicken breasts in the recipe here, you could use any type of chicken (I think thighs would work as well too), as well as pork. A two pound pork roast would substitute just fine in this recipe. Mix it up! Try something new and see what you think! Place the chicken breast on the bottom of your slow cooker.Whisk together the garlic, onion, honey, soy sauce, rice vinegar, ginger, and black pepper. Pour over the chicken breasts. Cover and cook on high for 4-5 hours, or until the chicken shreds easily.Remove the chicken from the slow cooker with a slotted spoon, and shred it using two forks. Place it in a bowl. Meanwhile, transfer the sauce left in the slow cooker into a medium sauce pan.Mix together the cold water and the cornstarch until smooth. Pour this mixture into the sauce pan with the teriyaki sauce from the slow cooker, and whisk well. Heat over medium high heat to a boil, boiling for 2-3 minutes, or until thickened. Remove from the heat and pour over the shredded chicken. Toss to combine. Yum!